Doubling your profits sounds like a major, all hands on deck effort. And a market with ‘pansies’ for competitors wouldn’t hurt. But let me give you some motivation – and proof- that it is a possible goal and you should attempt it. And that it is far easier than you think it is. 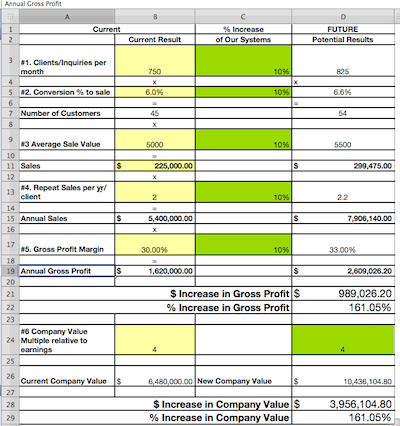 Just little 10% changes at 5 key leverage points in your business will double your profits. Just pick one leverage point a month to focus on, start making small improvements and in 5 months you have doubled your profits. Take a look at the Breakthrough Growth Calculator below that shows the incredible impact of 5 small 10% changes on your bottom-line. And perhaps more importantly, to the value of your business. The 5 leverage major leverage points in your business are. . .
Let’s give each of those a 10% tweak and watch your profits multiply. Take a look. It is truly amazing the leaps in sales, profits and growth that are possible from some very small actions. Which small actions have you been putting off? Really appreciated your presentation this morning on Mortgage Coach’s webinar. You hit the nail on the head on a nagging thought I have been having that the growth of my company is being held back by trying to do to many different things, ‘all things to all people’ so to speak. You have stimulated some new creative thinking, I have some pruning to do (tough business decisions to make about what to let go of and what to focus on). Also appreciated the point made on humility and seeking out the advice of others and to set aside time to do the strategic thinking. Greg, thanks so much for the kind comments. Looking forward to hearing your breakthrough story.